Changing someone's autocorrect is always fun. Especially when they're not technologically savvy and don't fully understand what's actually happening. Take Twitter user Michael Sana, who recently played a prank on a friend by changing words in his autocorrect to incredibly long quotes from Star Wars. 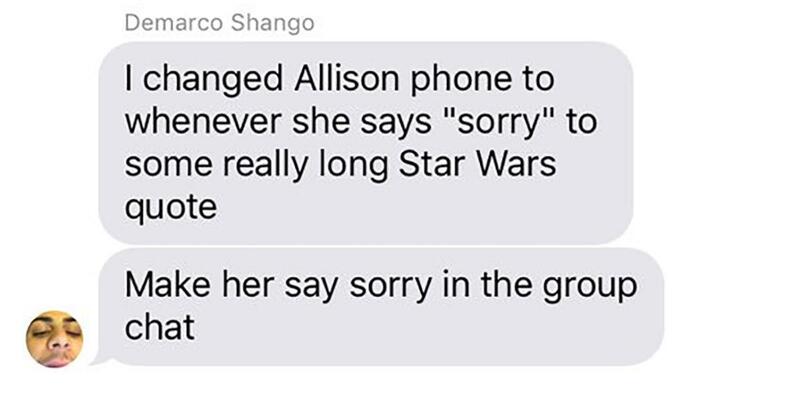 "I changed Allison['s] phone to whenever she says 'sorry' to some really long Star Wars quote," a boy named Demarco writes. "Make her say sorry in the group chat." Up to the challenge, the friend convinces Allison to play a game called "Finish the Lyrics." They start off with a One Direction song, then transition to the main event: Justin Bieber's "Sorry." Darth Plagueis the Wise? I thought not. It's not a story the Jedi would tell you. It's a Sith legend. Darth Plagueis was a Dark Lord of the Sith, so powerful and so wise he could use the Force to influence the midichlorians to create life... He had such a knowledge of the dark side that he could even keep the ones he cared about from dying. The dark side of the Force is a pathway to many abilities some consider to be unnatural. He became so powerful… the only thing he was afraid of was losing his power, which eventually, of course, he did. Unfortunately, he taught his apprentice everything he knew, then his apprentice killed him in his sleep. Ironic he could save others from death but not himself." People found the whole thing pretty hilarious. Whether or not Allison is a "Star Wars" fan, we bet she was super confused by her phone's apparent malfunction.